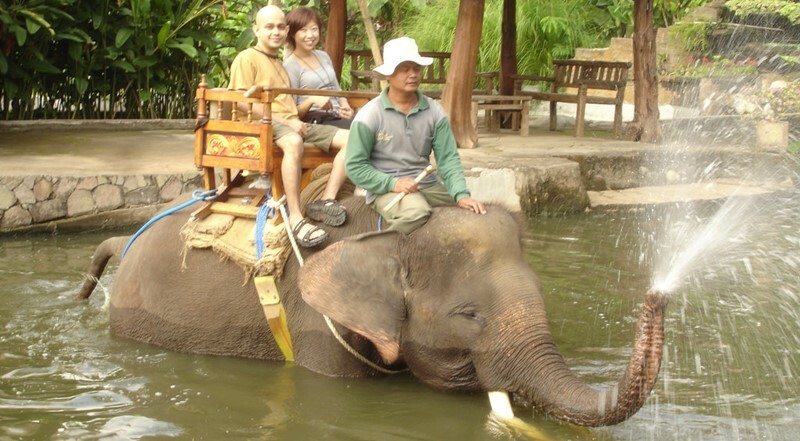 A Day Tour Combination to Bali Swing Accompanied by Our English Bali Driver-Guide. Home » A Day Tour Combination to Bali Swing Accompanied by Our English Bali Driver-Guide. Bali is a small island on behalf of republic of Indonesia with millions tourist visitor every year, do you know why Bali such as that attractive? The Answer is Bali offers a unique tradition, culture and Hindu Religion mix with local believe made Bali become the most different island compare to other 13.000 island in Indonesia, As the growing of tourist business Balinese keep tradition and keep welcome to visitors and other Balinese find a good idea, how to make visitors stay longer, of course instead of Bali has unique culture, we also try create other attraction related with tourist business like Adventure Water sport, white water rafting, and many other and one of the growing and must do if you in Bali is BALI SWING. Do you know where is Bali Swing ? Well if you start the tour with our experience Bali Driver from airport, its about 1,5 hour drive to reached the location, its located at BALI SWING Jl. Dewi Saraswati, 80352 Bongkasa Pertiwi, Badung Regency, Bali (Banjar Tegal Kuning), its quite close to Ubud center. The Bali Swing is the new tourism activity in Bali and it has become such a popular activity in Bali..
Bali Swing is worth to visit with your couple or with your family to join and experience thrill swing with freedom high hanging above the tree, Get your adrenaline pump up with our best view swing in Bali, are you sure won’t come here ? Its very easy to get to Bali Swing, surely we as BaliCabDriver team are ready to drive you there with many story from our driver while the journey from Airport to the location, please book advance your Cab through email or just WhatsApp us at +62 878 6196 8073 and make you appointment either start from airport or from your hotel, closer area to Bali Swing if you stay at Ubud , its take about 35 minutes drive. What Package you can get at Bali Swing? And what is the cost? 15 single swings (from 10m to 78m above the ground). 12 cute nests (the best located in Bali!). Photo shooting points: helicopter, “lost jungle boat”, the romantic bed on the edge, the heart rock in the jungle and 4 huge stones over the edge above the valley with an amazing view on the canyon and river waterfall, the access to the river beach and swimming pool with natural, non-chlorinated, river water, jungle waterfall and hanging bridge on the way to the river beach. The all above mentioned activities are not limited. # First come first serve. What other attraction you can combine with Bali Swing? If you love Take atv or quad bike, you may combine this tour with Atv ride at Bongkasa village, the ride about 2 hours pass the village, rice fields, jungle garden, stream and wet trek, if rain its more exciting as we have more mud and slippery and more challenge for you guys. At The same fields of Atv location also offers PaintBall Game, if you love to have combat with your group, why don’t try this Game ? If you like adventure wet activities, Bali Swing can combine with Penet river Tubing, Its has 3,5 km long journey with 1,5 hours trip along the canyon with Jungle, stop at Cave and bathing at Natural fresh water fountain and discover waterfall, this experience will give you memorable trip. Child from 5 years can joining this activities. At the Tubing Base Cam, we have nice spot for selfie with beautiful view surrounding. 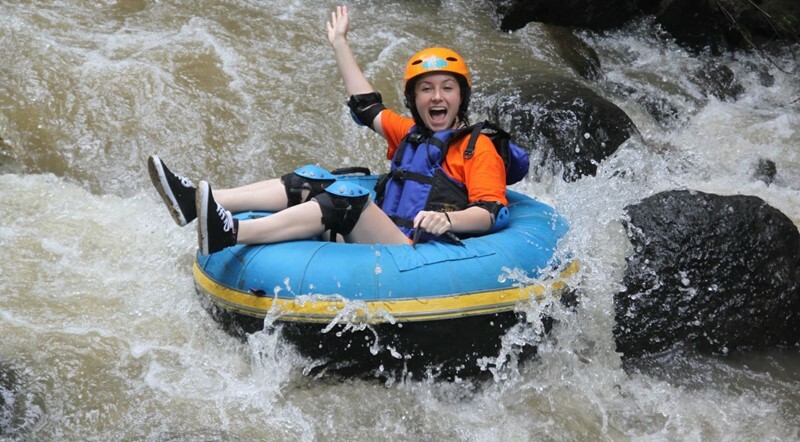 If you love adventure adrenaline activities, you may combine Bali Swing with Ayung river Rafting, enjoy the journey for about 1,5-2 hours along 2-3 grade river rafting, its safe for child from 7-64 years. This Ayung river rafting is also known as Ubud Rafting because its located very close to Ubud. We suggested you to book in advance if you want to experience this adventure. 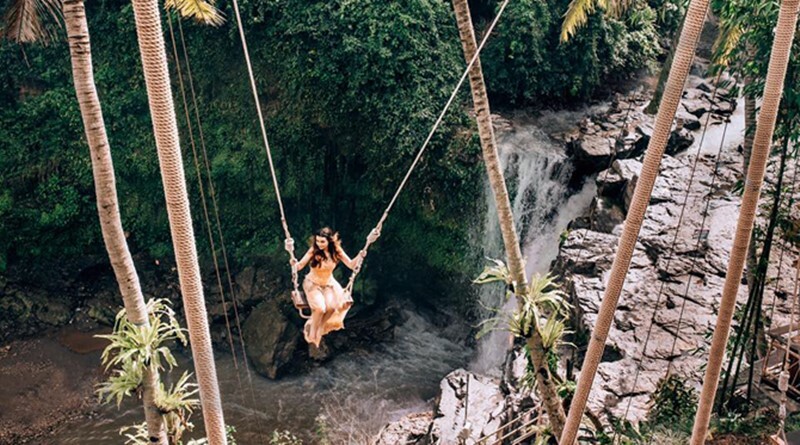 Bali swing can combine with visiting Sangeh monkey forest with tall nutmeg tree, inhabited by hundreds of grey monkey or Macaca is also an interesting visit for your family. Inside the Forest, we see A Temple called Pura Bukit Sari. Besides being well-known for its 600 long-tailed macaques (Macaca fascicularis), Sangeh is also known for its 10 ha homogeneous forest area containing hundreds of years of Pala (Dipterocarpus trinervis) forest, and the Bukit Sari Temple inherited from the Mengwi Kingdom in the century 17 along with the Lanang Wadon Tree. If you spend the noon at Bali Swing, around 15.30 we may depart from here headed to Tanah Lot Sea Temple, Enjoy amazing sunset point on shiny day, The Temple has Magis power with Tanah Lot as The Main Temple and at the west side, we have batu Bolong Temple, offers a beautiful view with Indian Ocean. If you come in the morning and spend 2-3 hours at Bali Swing, then you may combine with Ubud, spend the rest of noon at Ubud Center by exploring the Ubud Palace, Ubud Market and Ubud Monkey forest. You may walk around down town of Ubud, find the good café for drinks or light meals and bargain with the local to get the souvenir of Bali. Zen Hideaway is an accommodation located at Bongkasa and in the area with Bali Swing, its need about 45 minutes drive from Ubud, this accommodation has private swing for those who stay at this resort, its means the swing is not open for the public. This resort offer a serenity and peace for their customer, the swing View is almost same like Bali Swing, we can see the Ayung river with its mini waterfall, rice fields and also can see Mount Agung during bright day. The swing is hanging on coconut tree which offer majestic view and exciting and thrilling swing experience, wanna try this swing ? spend one night stay here and you can swing all day long. if you stay in Ubud, you need drive uphill to the north of ubud or heading to famous Tegalalang rice terrace, Its take about 20 minute before Tegalalang, you will find Uma Paket Swing, This main road is busy with Tourist bus as many tourist will pass this route leading to Kintamani village for the Volcano tour. Uma Pakel Swing is located on right side of the street, offers beautiful swing with humming bird’s nest is included in the package when you avail the edge swing. Above the nests are a bamboo constructed edge, Tegalalang Rice Terraces. Can see from here like bird eye fly. This swing also has the spices garden, where you may walk into the coffee tree, cocoa, ginger and many others tree can see here, visitor also will invite to taste some coffee, tea, ginger and other spices drinks for free, and interesting part of this spot, you may learn and see how the local farmer making coffee in traditional way, its unforgettable experience while you in Bali, if you love to have some souvenir like coffee, tea and other bargaining is a must here, try how good you are in bargaining, in Bali Women are best Bargainer, how about you ? The Swing entrance ticket start from IDR 200,000/person. Located in Tegalalang Gianyar and take about 30 minutes drive north of Ubud, you will be at Tegalalang rice terrace, this famous spot for tourist who looking for the best picturesque rice terrace view, we many tourist come to this spot to enjoy the view and also they may do some shopping along the street offers souvenir sell by the local from their small shop. If you want stop for lunch or just drink, you can find some café or restaurant with nice menu and reasonable price. The local people also try offers swing to visitors as the demand on this activities is booming, almost every you travel, you find swing. In Tegalalang, we have 2 Swing spot, one is near the main street and second one is located bit higher un the side of the rice terraces, the swing is hang between two Palm tree offer a nice view of amazing step rice terraces. Swing entrance ticket start from IDR 150,000/person. Located at Blansinga village, just on river side of Tegenungan Waterfall, D’Tukad River Clun and Swing is new tourist attraction, its also very close Krisna Oleh-Oleh Souvenir Bali which just opened for public. D’tukad River Club is opened on 27-July-2018, own by the Balinese name Mr Komang Agus, their idea is coming from a brilliant concept, He said: So Many Beach club in Bali, why not have River Club ? and finally His idea come true with existence the new and the only one river club in Bali. The Waterfall can be accessed via two way, First access from west side, the people call the waterfall as Tegenungan and from east side, the people call Blasinga Waterfall, so its one waterfall with two name. This Waterfall are visited by many tourist, and now with the existence of the D’Tukda River Club & Swing, the visitors are spoiled, they can relax, drinks, eat and play swing here. 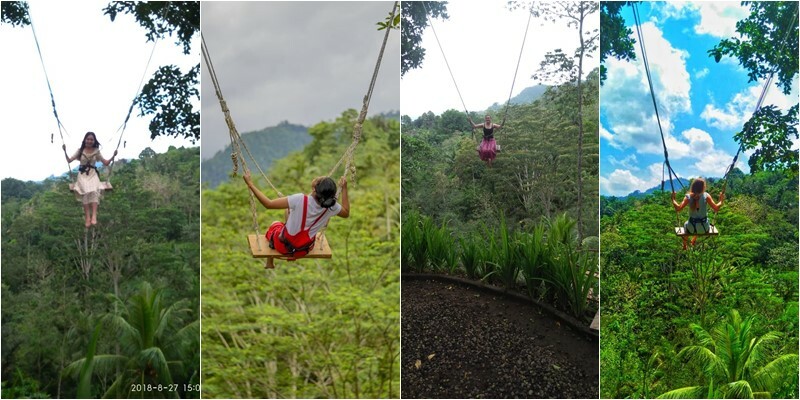 The Swing offers river view and Waterfall view, it’s the only one new swing in Bali offers this facilities, so book our Bali Cab Driver to take you here and enjoy your day with relax, lazy and soak in the pool, its beautiful day to spend here with your beloved partner or your family. Located in the village of Sribatu, Susut, Bangli Regency, with main street to Kintamani, made this spot visit by many tourist as enroute to See the Volcano view,they may stop for break here. BAS De Atayana (formerly known as I Love BAS Agrotourism) is the first agrotourism spot of Bali, and it has the concept of combining the nature with the result of plantation and agriculture. Adding with The Swing as the supporting facilities for BAS Visitors, its attract many tourist to come by, before the swing they can walk around into the local coffee tree, vanilla, fruits, spices, clove plantations, and also you can try various types of coffee, tea, ginger for free. This spot is the right choice for coffer lover, sitting down, relax and relieve stress while enjoy enjoy a cup of coffee. This swing has uniqueness as they have Love heart symbol on the swing, please feel curious with your own imagination, the best way is make it true by coming to this spot and how it is. Located in the highlands of Wanagiri, close to Munduk village, Sukasada district, Buleleng regency, if start the trip from Airport, Its took about 2 hours by car without stop, you will be here. Wanagiri Hidden Hills is surrouned by a series of whimsical vantage points over Lake Tamblingan and Lake Buyan, its located at the plateau area with green hill view.The local villager has and idea to build the photo selfi spot with many creature such as human-sized bird’s nest, wooden teacups, the bow of a boat, wooden stars, tree houses, an Indonesian interpretation of the Eiffel Tower with a giant swing overlooking the water below, and many more, please take your time to take photo as your loved spot.The Swing photo spot is an interesting part must to do if you come to this village, as the selfie spot located on the main street of Wanagiri and take Lake and Jungle as the view, there are some swing spot, we may drive slowly while open your window and feel the breeze cold temperature welcoming us, please prepare your camera for taking any photo shoot while slow driving, and finally till we found the nice spot as you like, then we will stop and spend some time here. If you has done with the swing and photo selfie with your belover partner, we may suggest drive further south and stop at Gobleg, where we have a nice spot for take photo of Twin lake view, please find your best angles for your best photo shoot. Its located at the eastern, Banjar Banyu Campah-Sidemen Bali , take your BaliCabDriver to take you for best sightseeing and visit Sidemen village. This village start follow the tourism business since 1990 where on that time only have a few homestay, as the tourism business growing, now days Sidemen is growing like Ubud in the past, you can find nice villa, homestay with village atmosphere and rice fields view, Mountain view, Agung Volcano view and also we have big river with clean water is another part make Sidemen is right place to escape from busy touristic. 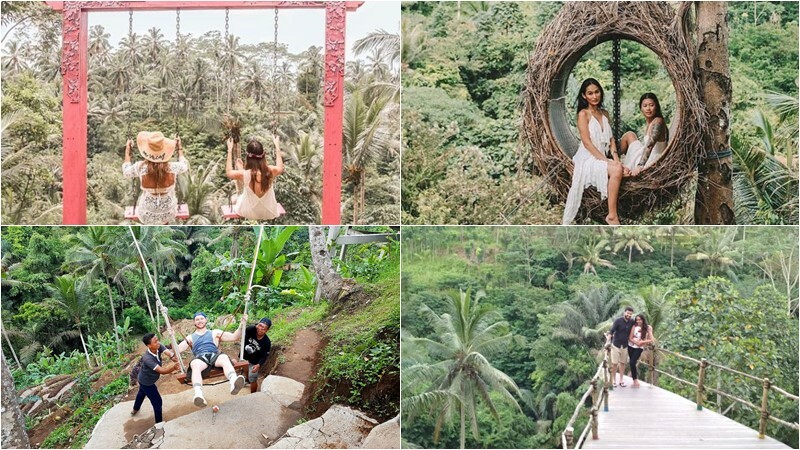 Sidemen Bali Swing is new attraction for tourist who pass this village or for those who stay here, they may come and try the swing. Swing in our village is doing by child in the past, but now its become tourist attraction and good business for local. The swing that is hanging between coconut trees, high on top the hill, and offers you a spectacular Swing experience. You may River view, rice fields, Hills and Mount Agung makes your swing ride thrilling yet addictive. Sidemen Swing is a perfect place if you are looking for serenity and peace, as the rooms here are semi-open, enabling you to enjoy the fresh air with view of sidemen . Only with us you can fell thrilling, adrenaline pump up and bring a nice memory back home to your country.